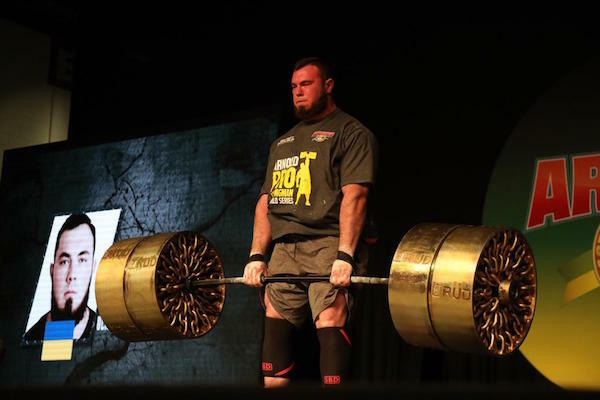 Home » Oleksii Novikov Is Victorious at the Arnold South America Strongman! The next chapter in the Arnold Strongman Pro World Series has been written in Sao Paulo, Brazil and it was a man from Ukraine who put the exclamation point at the end. Oleksii Novikov won the Arnold Amateur world title in 2018 and he now adds the Arnold South American pro title to his trophy case. More importantly, he is now qualified for the 2020 Arnold Strongman Classic. Here’s a breakdown of what happened in South America. For Novikov, taking each event one at a time is what helped him. He started out by placing 4th in the 600 kg Sled Pull for time. He would place second on the Circus Dumbbell for Reps with 6. He would finish 2nd again in the Yoke Carry as well as in the Atlas Stones. He would place 4th in the Deadlifts on Saturday night with 10 reps. Being in contention at all the events is what ultimately helped him secure enough points to win. Kieliszkowski was in the middle of the pack during the sled pull but came to like in the Circus Dumbbell Press. He actually set a world record by lifting the 120 kg dumbbell for 7 reps. He also won the Yoke Carry and the Atlas Stones. Unfortunately the kink in his armor is with the deadlift and that was the final event. He was only able to complete one rep with the 400 kg weight which placed him 7th. That would allow Novikov to take the overall win by one point. He had competed at the Europe’s Strongest Man the previous weekend so the back-to-back events may have taken a toll on him as well. The Estonian athlete won the Sled Pull but that would be his only win. He tied for 4th in the Circus Dumbbell Press, 6th in the Yoke, and 3rd in the Atlas Stones. What placed him on the podium was his performance in the Deadlift for Reps, where he completed 14 reps with the 400 kg.